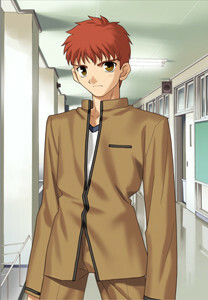 Shirou is a good-hearted and honest teenager, who always enjoys helping others. He is raised by Emiya Kiritsugu, who imparts on him basic sorcery, and the ideal of protecting the innocent. He is in his second year of High School, and his hobbies include fixing a variety of broken things, from VCRs to stoves, as well as cooking and cleaning. Shirou is unskilled in most traditional forms of sorcery, and he only knows Reinforcement, the power to analyze the structural composition of objects and increase their effectiveness by understanding their chemical and physical makeup, such as the sharpness and durability of a sword and shield. However, he lacks mastery for even this simple spell, and his various applications of it are limited.